People flowed into Pepsi Center while Toronto based rock band Metric laid down their unique brand of music. 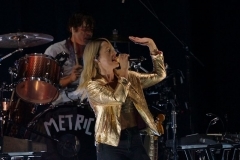 Lead singer Emily Haines, wearing a gold jacket to match her microphone, brought the focus of attention appropriately upon herself. Metric was thoroughly entertaining for those waiting for the main act to begin. The Smashing Pumpkins Shiny and Oh So Bright Tour 2018 delivered exactly what was expected of them. They played all the fan favorites and enough covers to keep everyone excited and entertained. The set was simple, yet very well utilized. A pair of giant screens slid in and out of site effortlessly while displaying videos or artwork or childhood photos depending on what worked best for each song. Additional smaller backdrops loaded with lights and video screens were rolled around almost magically. Combined, these screens and lights added up to provide additional entertainment when the band was less interesting or slid out of the way and went dark (or lit up in a new location) in appropriately dramatic fashion when called for. But that’s all beside the point. The point for this band is simply Billy Corgin. 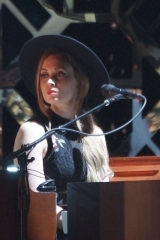 While the rest of the band is amazingly talented, it’s all about Corgin. His music, his vision, his quirky, slightly odd. personality, Him. Even though he spent much of the show looking down at his guitar, he still managed to be the focus of attention and admiration from the crowd. So the crowd got their money’s worth, but it wasn’t sold out. They closed the arena’s top tier of seating in order to fill up the lower tiers. About halfway through the show Corgin let guitarist James Iha sing one. Then a few songs later launched into a cover of Bowie’s classic Space Oddity (Major Tom). After 3 plus hours of music the audience was satisfied. Smashing Pumpkins provides a point of focus and fond memories for people who were growing up in the 1990s. they will always have that and it’s cool that Corgin and his band can take them back down that road once in a while.